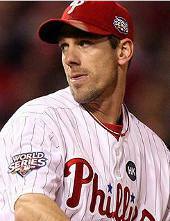 Home » 10-11 Offseason » Cliff Lee to Sign with Phillies? Cliff Lee to Sign with Phillies? Throughout the Cliff Lee Pursuit of this offseason, a “mystery team” has been mentioned as an afterthought while the Yankees and Rangers seemed to be the frontrunners. In some ways, it reminded me of the 1992 Presidential election between George H.W. Bush and Bill Clinton, with Ross Perot running on the Independent ticket. Except, Perot never had a chance. Whereas, if we are to believe the rumors of this evening, Perot … er, the mystery team … not only has a chance but may well win the election … er, pursuit. And that mystery team is the Phillies.